Remove all debris from your composite decking – The first thing that you need to do when maintaining your outdoor composite decking is to clear off and sweep your decking to remove any debris. It is important to remove all debris from your decking for a number of reasons including receding the chance of slips, trips and falls and reducing the chances of your composite deck boards becoming damaged. Don’t only pay attention to sweeping debris from the top of your planks, but also the gaps between your planks. Give your composite decking a wash – After you have thoroughly swept your composite deck boards, it is time to give them a good wash. You can generally wash composite decking pretty well with a simple warm water and detergent solution. However, if your deck boards are incredibly dirty it is probably best that you use a power washer at this stage or a strong hosepipe to wash your boards. Tackle stubborn stains – Once you have swept and cleaned your composite decking you will easily be able to spot any stubborn stains. You should tackle these stains one at a time, checking with your composite decking supplier the best products to use. 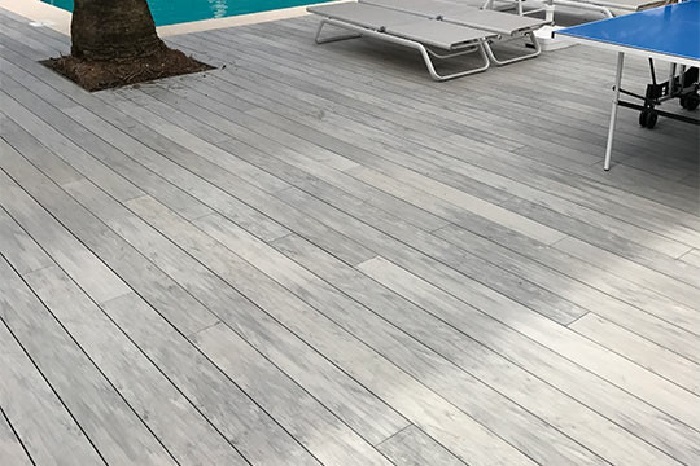 It is always best to ask your composite decking supplier so that you can be sure to used cleaning solutions that are not going to cause any further damage/staining. Replacing deck boards – One of the great things about composite decking is that if one of your deck board gets seriously damaged you can just replace that particular board instead of having to invest in entire new flooring. If you have any damaged boards you should now replace them as otherwise accidents may happen that could have been avoided. These are only some of the available spring-cleaning composite decking maintenance tips too! If you require further advice and guidance do not hesitate to contact your composite decking supplier today who will no doubt be delighted to assist you.